Loss of focus. Headaches. Irritability. Back pain. Countless people suffer from these ailments on a daily basis. The list continues with issues like constipation, loose skin and constant appetite. For many people, the culprit is dehydration. In fact, dehydration is also the leading cause of daytime fatigue. The solution is water. Everyone knows the life-sustaining importance of water. It’s quite possibly the most powerful substance in the universe – nothing can survive without it. It is vital to the ongoing renewal of the environment and continual growth of every living thing, including the human body. In fact, water constitutes about 60 percent of the male body and 50 percent of the female body. With such an astounding dependency on proper hydration, it’s no wonder negative symptoms emerge when dehydration occurs. Still, most of us neglect to embrace water for its beneficial qualities in our own bodies. Shockingly, 75 percent of Americans do not drink enough water. Two to five percent causes dry mouth, flushed skin, fatigue and headaches. Six percent can lead to increased body temperatures, pulse rates and breathing. Eight percent results in dizziness, weakness and difficulty in breathing while exercising. 10 percent leads to muscle spasms and disorientation. 11 percent may result in poor blood circulation and kidney function. Although other health conditions can cause these symptoms as well, dehydration is often a primary contributor. Given the proper resources, your body can typically fight off most illnesses, and water is vital to that process. Of course, if symptoms persist, you should see a physician. 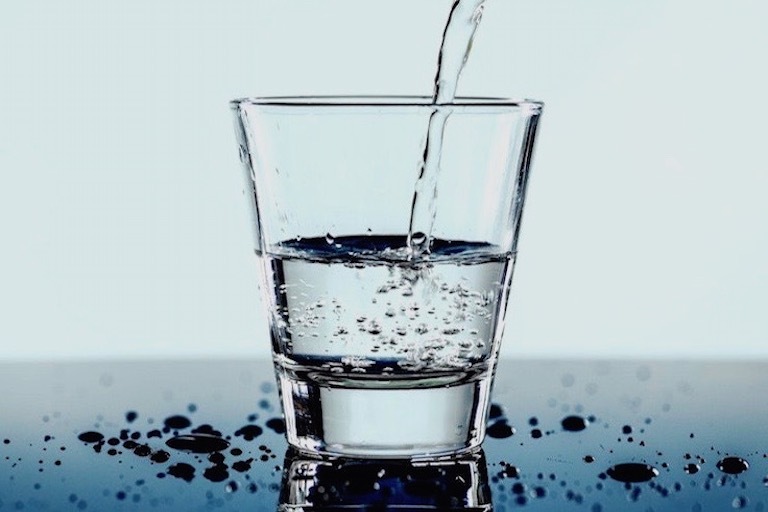 On average, a person should consume at least half of his or her body weight in ounces of water a day. So, the 130-pound individual needs 65 ounces of water daily. Other factors like warm weather or exercise increase the needed amount. For every 20 minutes of exercise, an additional eight ounces of water is recommended. Busy lives make it a challenge to meet that goal. When it comes to your hydration sources, 80/20 is the proportion to keep in mind – 80 percent should come from beverages and 20 percent from the foods you eat. Although drinking water is the optimum source for hydration, it isn’t the only one. Other options include milk, juice and tea, which are largely comprised of water. While sodas and coffee can contribute somewhat to your hydration needs, they should be consumed in moderation and not relied upon as a primary source. Especially in the heat of summer months, be sure to take proactive steps to protect yourself from dehydration. Never wait until you are thirsty to hydrate. Try to drink most of your fluids between the time you wake up in the morning and the early evening hours, instead of drinking your daily quota all at once or late at night. This will help your body process the fluids before bedtime. Starting off the day with eight ounces of water also replenishes what you lose while sleeping. Staying hydrated in the hotter months of the year can present a challenge. Try adding a little more salt to your diet; doing so can help your body retain water more easily. Also, try keeping your favorite water bottle nearby so the next sip of water is more inviting. Another way to boost your efforts to stay properly hydrated is to carefully choose the foods you eat. Fruits and vegetables like watermelon and tomatoes are a great source of not only hydration but other essential vitamins and nutrients like Vitamins C and E and potassium. So, give yourself a nice afternoon treat by choosing fruits and vegetables as a replenishing snack. Pause for a moment to take inventory of your physical condition, and, where appropriate, make adjustments to your lifestyle. Doing so will enable your body to protect your joints and organs, rid itself of waste more efficiently and deliver oxygen to your cells. In addition, proper hydration can help you stay fit since muscle is 75 percent water. Everyday choices you make today could dramatically alter your health, and even small changes in your daily routine could decrease the occurrence of minor illnesses, aches and pains you experience. Stay hydrated; stay healthy. For more information about dehydration, visit www.nwhealth.edu or www.mayoclinic.com.